From before you even wake up in the morning, your day is being encoded into digital data. Your phone understands when you are active versus when you are asleep. Social media sites know when you’ll make your first post and which triggers they can plant in your inbox to ensure you do. Soon, several device makers know you are listening to the morning news, as you do every weekday. Your search engine and many other services know that you are trying to make the perfect pancake for your kids. A number of databases are recording the fact that you are at home later than usual today and not requesting a ride anyplace. And this is all before you’ve put on your slippers. Our digital self has become a vivid representation of our wants, needs, motivations, and insecurities. While it’s pretty amazing how much of our lives become data today, the demand for new dimensions of personal data will continue to increase as algorithms and the technologies that use them become more sophisticated. In my hand-wavy chart above, I’m making an assumption that demand and ability to collect personal information is growing on some unknown exponential function. It’s pretty amazing to think about what we can do, as individuals and as society, with access to the digital half of our existence. Too bad none of us really control our digital halves. For lack of a better analogy, our digital halves are something like indentured servants. We hand over long-term rights to these digital representations of ourselves to most of the digital services we use today, our digital self goes to work each day for other companies while we benefit from some new social interaction with a well placed ad. In some cases, just participating in the real world is enough to sign over the right to your data (see Equifax). After signing over the rights to our data, we have little to no visibility into what our digital self is up to any more. We don’t know what work our other half is doing or to whom it really belongs. Before reading more, consider joining the Textile Photos waiting list — an application designed to help keep control of your data. Unfortunately, lack of control is still only part of the explanation of the unhealthy relationships we have with our digital selves. The more complicated reality is that most people don’t even think about the lease they sign or what data they hand over to companies. Because it is unknown, companies tend to try to hide it from their users. In hiding it from their users, they try to collect as much data as possible without setting off any alarm bells. It means that they scratch and scrape away at our data to build incomplete and likely inaccurate digital representations of each of their users. Each company doing this gets a slightly different set of data and creates a slightly different and inaccurate copy of the digital you. Your many fragmented digital selves are now being put to work to train the algorithms that change the world around you. They optimize your transportation, silence your phone while you sleep, show you those boots again, and prune the posts you see in your social network. Some of the algorithms being trained are forming the building blocks of tomorrow’s AI. Unfortunately, these fragmented versions of ourselves are often the least creative, most biased, and most simple-minded versions of us. We aren’t presenting our best and most admirable qualities on the web and taken as a whole we are probably painting a pretty ugly picture of society. Did you get a chance to look through your Facebook data export? Have you scrolled through your Google search history? How about Amazon purchases, or your Instagram browsing, or your credit card history? Technology isn’t going to stop. But while that may sound bleak, we also know that personal data could give us the power to improve the world around us in totally new ways. So how can we each regain control of our digital self and put it to use in technology and algorithms that work for us, not over us? Imagine a future where you controlled the data behind your social connections, your fitness, your travel, you browsing data, your key strokes, your medical records, your coffee preferences, your foot size, and everything in between. If you felt secure in storing that data, knowing that no agent could be reading or selling it at will, you could start building the complete and accurate digital representation of yourself. With this data in your control, you could empower technologies you love to do more work for you and to do it better. You could help empower the future of algorithms and AI with your best self. You could drive competitive platforms where applications could come and go but your digital record would live on forever, in your control. So why don’t you do it already? The problem sneaked into our modern existence. The internet wasn’t really designed for personal data, but so many companies have been designed to collect it. As a society, we just never had a chance to stop and think about the significance of the digital self in our daily lives. Today, people are joining this conversation faster than ever, but real challenges still sit between us and the solution. We currently lack viable models for personal data ownership that enable us to still drive technology forward. We lack the mechanisms for individuals to collect and own their personal data outside the virtual walls of a few huge companies. And, we lack the protocols for a user to grant use-based permissions to their data and gain ownership over the information generated from that data. Chris Dixon’s Why Decentralization Matters makes the case for why we see many of the consumer platforms we join and love eventually turn into platforms that seem to do things we hate. A simple point from that blog post is that companies increase their value by adding new users, and so do everything in their power to appeal to those users. After time though, their user growth levels off, and they need to find new sources of value growth. This is the bait-and-switch moment, where users suddenly become the product. The lesson of the past decade is that hyper-growth technology companies built as fully centralized systems overwhelmingly reach that bait-and-switch moment. It also explains why so few companies give personal data (or the information they derive from it) back to their users, it would undercut the companies long-term value strategy. If we want to give ownership of personal data back to the individuals, it is important that we create decentralized systems that can guard users from that same sell-out moment. Until very recently, decentralized data storage (and personal data storage more broadly) had very few viable options. Personal data accumulates quickly, meaning storing all your data on your mobile device or even on your laptop quickly becomes unreasonable. Even if you could create a local copy of all your data, your data isn’t valuable to you unless you can put it to work in (mostly) external systems and applications. Why not just do it in Dropbox, Google Drive, or another service? The first part of the answer is monopolies, lock-in, and fitness-for-use. The second part of the answer is that the value of your data in these centralized services is extremely limited, and primarily limits the value that the creators of these services want to offer you. So as a consumer, your best choices for storing all of your data aren’t really very good choices at all. This is changing rapidly with the rise of decentralized protocols like IPFS and DAT and storage markets like Filecoin and Storj. We believe that those markets can bring down the price of decentralized data storage such that every individual could each store a compete copy of their digital data, forever. Decentralized storage is an ideal fit for personal data because, combined with secure and verifiable protocols, it can give users a low energy way to move their data across platforms and it can give developers dependable mechanisms on which to build future applications. At Textile, we are tackling personal data collection, storage, and protocols through a decentralized data wallet, where any users can encrypt, store, and control their personal data. Textile Photos, for example, allows users to easily populate their wallet with privately encrypted photos. Every photo can then be stored and backed up across devices on IPFS or shared in private, peer-to-peer threads. The Textile Photos mobile application gives us an environment to develop and refine the Textile Wallet. Our long-term vision is an ecosystem of developers, applications, and platforms across which users can fluidly move at will. Each time a user joins a new application, they will know exactly how, and what parts of their data are being accessed because those permissions will be controled through their private wallet. They also can retain ownership of any new data or information an application creates for them. The combination of private encryption — no agent could ever see a user’s data by force — and decentralization will give new kinds of value to users. For example, even from the earliest days users are largely protected against the future bait-and-switch dominate into today’s consumer applications. User’s will never have to lose the data and information they generate just because a single application goes away. Developers of applications could build on top of the open source data wallet to provide a better experience to users. Using a private wallet, leveraged by a user across many applications, may help each individual application side-step the challenge of bootstrapping entirely new user networks. Perhaps through decentralized, user-owned data we can find new ways to compete with today’s existing centralized monopolies, yet another long-term benefit to end-users. 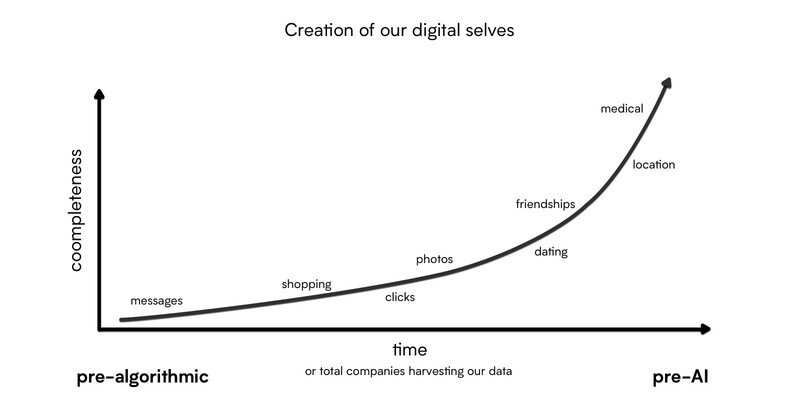 We are excited to think about a future where we each have full control of the full record of our digital selves. These complete records will play important roles in the future, beyond interacting with today’s applications. Privately signed personal data, for example, may help us develop new mechanisms to build digital trust, prove authenticity, and protect against algorithmic counterfeit (e.g. Deepfake). At a higher level, we can look for better ways to create models for AI that better reflect our aspirations as individuals and as a society. Even in our daily interactions with technology, a personally controlled digital representation of one’s self may have very noticeable benefits over today’s systems. With more complete representations of our digital self it should be easier to avoid echo-chambers, discover useful information, and benefit from services across the internet. Primarily though, we can start building the digital representations that will stay with us for the decades to come instead of having fragments of ourselves shuttled away to private databases we never hear about. User’s can think about adding more information to their digital self, not finding ways to censor and delete it. This is the way many of us want it to be: user’s emboldened by choice and security. If you are excited by the possibility of this future, let us know! We are sending out new invites to our waiting list nearly ever day, so drop your name into the mix. Your signing up will get you on the list, and has very real value to us as well, letting us know that there are people out there looking for, and interested in, alternatives to the systems we’re locked into today. We’re also always looking for feedback and you can find us on Twitter, Slack, Telegram or email. We’d love to hear from you.